The 2016 WindUp/WineDown/MusicOnTap – Another Successful Event! As it’s been said, good things just keep on getting better and better! This year’s event featured music by The Good Guys duo, which received great reviews from those who attended! Wine sampling and sales by the Greenhouse Winery, beer by the glass from Full Pint Brewery, the food from 2 Ladies and a Gentleman catering, and the Pittsburgh Popcorn Company popcorn buffet, and some room and process redesign made the evening a delight, and a great kickoff to the holiday season! Plans are already underway for the event in November 2017, and a big change is on the way – it’s the event date! Mark your calendars for SATURDAY, NOVEMBER 11, 2017 (a week earlier). The Good Guys will be back, and the Greenhouse Winery is the place! Tell your friends, and we look forward to seeing you there! AVAILABLE FOR PRE-ORDER: Con4mity WINES! 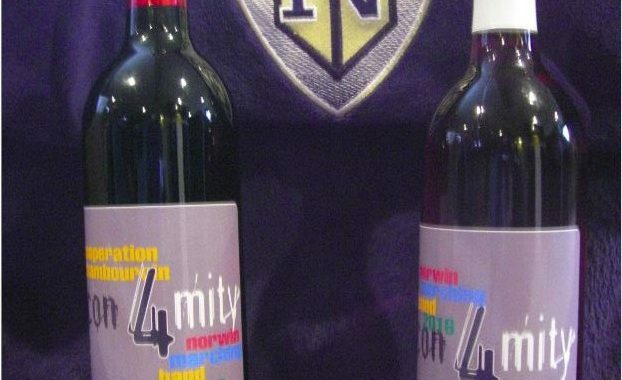 Bottled exclusively for the Norwin Play it Forward Fund by The Greenhouse Winery. One of Greenhouse’s signature fruit wines, perfect for a Thanksgiving table. If you are attending the Norwin Play it Forward Fund event at the Winery’s Irwin location on November 19th, your preorder will be ready and waiting for you!! A very limited supply will be available after 11/20, so pre-orders are requested. – to download a copy of the order form. and email to Sharon Bass at sharon.p@comcast.net. The 2016 Wind Up/Wine Down/Music on Tap – Tickets on Sale Now! 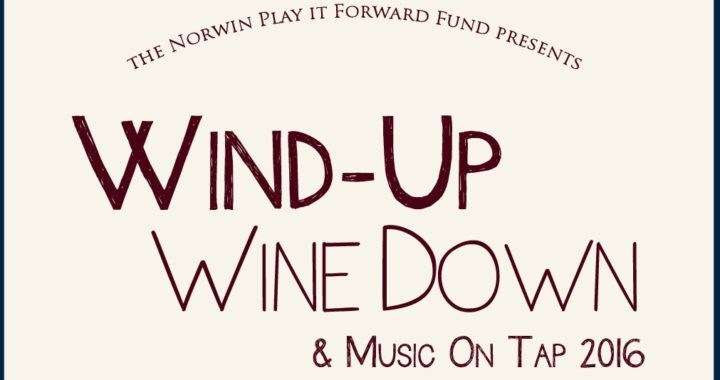 The 2016 Wind-Up, Wine-Down and “Music on Tap”, an adults-only wine-tasting, beer-sampling and live music benefit for the Norwin Play It Forward Fund, will take place on Saturday, November 19, 2016 at the Greenhouse Winery in off Pinewood Road (off Mars Hill Road) in Irwin, PA.
Our 7th year features music by The Good Guys duo (think Beatles, Eagles, CSNY, and other classics of the pop/rock genre), wine sampling and sales by the Greenhouse Winery, beer sampling by Full Pint Brewery, food from 2 Ladies and a Gentleman catering, the Pittsburgh Popcorn Company popcorn buffet, and some very nice prizes! Tickets are only available online this year, at $40 per person. The event has sold out every year, so make plans now to attend. Reservations can be made by ordering your tickets on Eventbrite by visiting this link. Corporate sponsors and donations in-kind for the event are sought as well. If your business has put a package together for the Norwin Play It Forward Fund in past years, we’d appreciate your kind consideration once again. All proceeds from the event benefit the fund. While it’s taken some time to post a review of the event, that doesn’t mean it wasn’t a great one! Ask anyone who attended. The student performers were awesome, and the evening was enjoyable! Because some changes were put in place last year, and the event was more successful than ever, we kept them in place for 2016 – focusing on the students in the Norwin Band, and keeping the admission price low to accommodate as many supporters as possible to participate in the experience. With desserts provided once again by Kings Family Restaurants and the Popcorn Bar featuring popcorn from the Pittsburgh Popcorn Company, the evening featured great music performances, as the students of the Norwin Band created their own ensembles to provide the evening’s entertainment. The only auction of the evening was the “Almost Famous” Cake Auction, with cakes and desserts from local bakeries, some bringing over $100 to benefit the Norwin Play It Forward Fund. The evening’s door prizes were also a hit, and our thanks goes to ProBikes and Main Street Music and Sound. 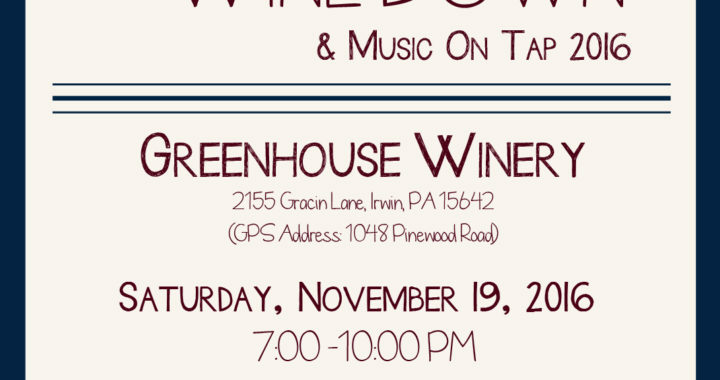 We hope to see you at the Wind Up/Wine Down/Music on Tap to be held at the Greenhouse Winery’s new location on November 19. It’ll be a little different this year. If you’d like a sneak preview of the music, come to the Greenhouse Winery on Sunday, September 11 in the afternoon! It’s been a tradition that the Norwin Play It Forward Fund’s fall event sells out, so this year’s event held at the Greenhouse Winery’s new venue held the promise of holding more people…and it was still a sell-out! Chris Thomas and friends provided the music, and wine sampling and sales by the Greenhouse Winery, the popcorn buffet catered by Pittsburgh Popcorn Company, and many prizes were featured, as has been the tradition. In addition to Greenhouse Winery’s new venue, hors d’oeuvres from Woody’s Catering and beer sampling by Full Pint Brewery added a few new touches to the evening. Pittsburgh jazz saxophonist Mike Tomaro also attended the event, and brought his saxophone along too! Plans are already underway for the event in November 2016, and we’re changing it up a little bit more to keep it interesting. You and your friends won’t want to miss it. Stay tuned for more details! What a great night! What a great cake auction! What great students! What great volunteers! Thanks especially to Tom and Paula Steiner who chaired this event this year! It sounds trite to say, but very literally, we couldn’t have done it without you! This year’s event was a little different, in that the focus was on our students, and the admission price was kept as low as possible to allow as many supporters to attend to experience the music as performed by members of the music program in the Norwin School District. With desserts from Kings Family Restaurants and coffee from Coffee to You Barista, the evening featured some incredible music performances, with some original compositions and some original arrangements created by the amazing students in the Norwin Band. While there were no Chinese auction prizes as there were in the past, the “almost famous” cake auction took another step toward infamy with cakes and desserts from local bakeries, some bringing hundreds of dollars to benefit the Norwin Play It Forward Fund. The prizes will return this fall at the Wind Up Wine Down, to be held at the Greenhouse Winery’s new location! We hope to see you there! We hope you have your tickets reserved for this year’s Wind Up Wine Down! Our 5th anniversary event will be held once again at the Greenhouse Winery in Rillton, PA on Saturday, November 22nd (the Saturday before Thanksgiving) from 6:30 to 10 PM. When we said this 21-and-over event sells out quickly since seating is limited, we had no idea it would sell out even before the Norwin Band’s marching season was over! Our apologies to those who may have been planning to attend, but a waiting list has been started. If you’re still interested, please contact Fallie Princeton at 724-864-1426, and thank you for your continued support! It’s hard to believe that our Mad Mex Dinner was two weeks ago. We’d like to thank the big Burrito Restaurant Group who chose the Norwin Play It Forward Fund to benefit from one of their Benefit Dinners, the 36 folks that made plans to attend this unique evening, and a especially thank a generous benefactor who donated the use of a motorcoach to get all of us there and back safely. We’d also like to extend our gratitude to Dr. William Kerr and the Norwin School District for allowing the attendees to park their cars in the Norwin High School parking lot, providing a convenient pick-up and drop-off location. The folks at Mad Mex in Robinson Township couldn’t have been nicer, even bringing out take-home containers so all could make “to go” plates to take the leftovers home! The Norwin Play it Forward Fund’s fifth annual Suite Café, a family-friendly coffeehouse event to benefit the fund, took place Saturday, May 10, 2014 at Norwin High School in the “Suite Caféteria.” You know we’ve been waiting to say that! Musical entertainment was provided by Norwin instrumental students and their instructors, attired in their prom finery, since the event is held the day after the high school prom. We’re unbelievably blessed here to have students that will sacrifice their “day after the prom” activities and actually audition for the opportunity to play for parents in a musical setting that’s not typical of a high school band or orchestra program. Doing so gives musicians the experience of both a recital for those who have come to specifically hear them and their friends in solo performance or in combos that they put together, as well as the experience of enhancing the ambiance for an event where people come to share time with their friends, and enjoy coffee and dessert. Coffee beverages were provided by locally-owned Barista to You, and the popcorn bar from the Pittsburgh Popcorn Company popularized at the NPIFF’s fall event was featured, along with desserts from area restaurants. Chinese raffles, a 50/50 drawing, and the “almost famous” live cake auction will rounded out the evening. The door prizes for the evening were especially popular, featuring a guitar signed by The Clarks and donated by Main Street Music; a Pittsburgh Pirates basket with a Jordy Mercer autographed ball; a tablet computer; a Cannondale bicycle; and a Kindle reader!